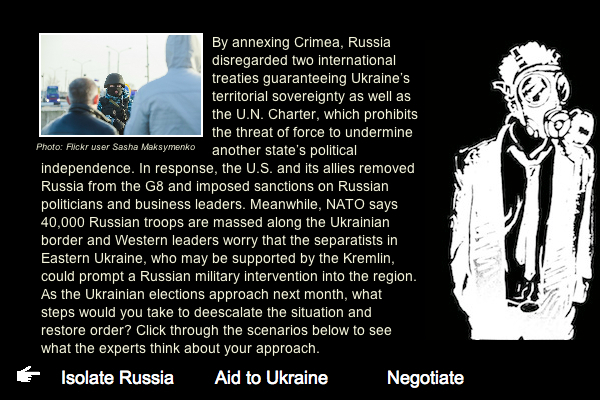 Ukraine: What would you do? Having grown up in Soviet-occupied Ukraine, Brooklyn resident Olha Yarema-Wynar remembers that there were certain rules she had to follow in school. Religious holidays, expressions of Ukrainian culture, even her native language were all suppressed by the government, she recalled while speaking to me on the boardwalk beside Brighton Beach. For many Ukrainian immigrants who fled to America during the Cold War, the memories of Soviet occupation are still fresh. In New York, across the world from where protesters huddled around campfires beside the Euromaidan, the Ukrainian community organized protests of its own. In February, they carried their blue and yellow flags across the Brooklyn Bridge to show support for the populist uprising that had just ousted Ukrainian president Viktor Yanukovych. The Ukrainian Institute and the Ukrainian Museum, which are both located in Manhattan, issued statements of support for the protestors in Kiev. And when the Russian ambassador arrived in New York to speak at the United Nations, hundreds of Ukrainians marched to the Russian consulate’s doorstep on the Upper East Side to protest Russia’s invasion of Ukrainian Peninsula Crimea. The invasion and eventual annexation of Crimea turned what began as a popular uprising into a global confrontation between Russia and the West. By seizing Crimea, Russia violated several international treaties that guaranteed Ukraine’s territorial sovereignty. The United States and its allies responded by casting Russia out of the Group of 8 industrialized democracies, or G8, and sanctioning several Russian politicians and business leaders. The tension between the two world powers has only escalated since then. To better understand the long-term consequences of this crisis, I interviewed three experts on Eastern European politics. Walter Zaryckyj is the executive director of the Center for U.S.-Ukrainian Relations. I also spoke with Columbia University political science Professor Robert Legvold and Brooklyn College political science Professor Janet Johnson, who both specialize in Russia and post-Soviet states. We discussed different diplomatic strategies that the West could take against Russia and what the outcomes of those choices might be. I took their answers and created what I can only describe as a “choose your own adventure story” about diplomacy between Russia and the United States. It’s important to note that no choice perfectly resolves the crisis. So as you play, think about what you want to accomplish. Would you like to repair the West’s relationship with Russia, restore order in Ukraine or send a message to Russian President Vladimir Putin that violations of international law will not be tolerated? Think carefully about your decisions and see what the experts say would happen if you were in charge. Photo at top: Flickr user mac_ivan. A Brooklyn mom can’t find skin care products for her children and launches her own product line. She also studies business and becomes an entrepreneur. Her store, Brooklyn Flavors, in Prospect Heights, Brooklyn sells a full range of her homemade soaps, lotions and soybean candles. Kamilah Ervin reports. In An Intimate Press Event, Reporter Amanda Rodriguez Met With A Few Of The Makers of Radio City Music Hall’s Newest Work, Heart & Lights. 1st Debate Led to 2nd and Finally to Today! Bye Bye, Marty! Bklyn Will Miss You! Consumer reporter Jah-Milka McClean compares smartphone plans. Randy Rojas reports on The Inspired Word, which gives New York City artists a sense of community. Video journalist Taylor Baker reports about a Long Island neighborhood where homeowners complain that a history of soil contamination makes it difficult to sell their homes. Video journalist Virgilia Hess goes home to France and discovers what American students studying in Paris think about the experience.